A U.S.-led international consortium plans to renew its call this month for North Korea to compensate for losses incurred from scrapping a project to build two light-water reactors for the communist state, a senior Seoul official said Tuesday. The move, which is likely to irritate North Korea after the death of Kim Jong-il, had been originally decided upon just weeks before Kim died of a heart attack in December last year. The Korean Peninsula Energy Development Organization (KEDO) decided not to drop the demand for compensation from the North. “The KEDO will send an official letter this month to North Korea, demanding it compensate US$1.89 billion for the termination of the light-water reactor project,” the official at Seoul’s foreign ministry said. The KEDO, which also includes South Korea, Japan and the European Union, officially shut down the multi-billion-dollar project in 2006 after North Korea was caught by the U.S. pushing a second nuclear weapons program based on enriched uranium in addition to its widely known plutonium-based program. The consortium has since been asking North Korea to return the money it poured into the project. Prospects for the call have remained dim, however, given the North’s economic hardship and belligerency. The $4.5 billion project, which was about 35 percent complete, dated back to a 1994 deal linked to North Korea’s promise to denuclearize. In return, the KEDO agreed to build two 1,000-megawatt light-water reactors. In September last year, amid renewed diplomatic efforts to resume the six-party talks on ending the North’s nuclear drive, Pyongyang abruptly demanded $5.7 billion in compensation, claiming that failure by the KEDO to build the reactors caused it heavy financial and other losses. “The KEDO’s renewed call for compensation would be an official reply to counter the North’s demand last September and has nothing to do with the passing of Kim Jong-il,” the official said on the condition of anonymity, brushing off concerns about possible irritation at the North. The official believed that North Korea demanded compensation last September as part of its “negotiating ploy” to raise the issue of the halted project if the six-nation talks resume. The death of Kim left many policymakers and analysts wondering if his youngest son and chosen heir, Kim Jong-un, will be able to successfully consolidate power in Pyongyang. Shortly before Kim died, the United States and North Korea were apparently poised to announce a breakthrough toward the resumption of multilateral talks, which has been dormant since late 2008. Other members of the talks include South Korea, China, Russia and Japan. South Korea, the U.S. and Japan have insisted that the North must accept a monitored shutdown of its uranium enrichment program before the aid-for-disarmament talks can resume. 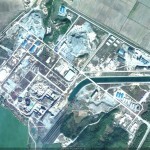 Pictured above (Google Earth): The KEDO light water reactor construction site in Sinpho County, South Hamgyong Province. See in Google Maps here. An international consortium once tasked with building two power-generating nuclear reactors in North Korea will soon demand that the communist country provide US$1.89 billion in compensation for the project’s failure, a Seoul official said Monday. The demand comes after North Korea filed its own compensation claim worth some $5.8 billion in September, saying it suffered heavy financial losses and other troubles from the failed project. In a 1994 deal linked to North Korea’s promise to denuclearize, the Korean Peninsula Energy Development Organization (KEDO), which includes South Korea, Japan and the United States, agreed to build two 1,000-megawatt light-water reactors in the communist country within several years. After years of delays due to poor funding and other problems, the project fell through in 2006 after the U.S. caught North Korea pushing a second nuclear weapons program based on enriched uranium in addition to its widely known plutonium-based one. The $4.2 billion project was about 35 percent complete when the KEDO called it off. The latest development comes as diplomatic efforts are under way to revive the stalled six-party talks on ending North Korea’s nuclear weapons programs. Pyongyang is pushing for an unconditional reopening of the multilateral negotiations it walked away from in April 2009, while Seoul and Washington insist that the communist country first demonstrate its sincerity toward denuclearization through such pre-steps as a monitored shutdown of its uranium enrichment program. The forum, which offers economic and political aid to North Korea in exchange for its denuclearization, also involves Japan, China and Russia. The Korea Times also reported on this story. North Korea has reused equipment and materials left from the halted construction work on light-water reactors, breaking a prior agreement with a multinational organization that oversaw the botched construction project. According to the Unification Ministry and other sources, North Korea has taken 190 vehicles from the site in Kumho, South Hamgyong Province, and 93 pieces of heavy equipment, including cranes and excavators, and is likely using them for military purposes. Sources said thousands of tons of steel bars and cement and communication devices are also being used by the North. In late 2005, the Korean Peninsula Energy Development Organization, also known as KEDO, stopped construction of non-military nuclear reactors in the North. The work had begun in August 1997 as part of the 1994 Agreed Framework between the United States and North Korea. Under the terms of the agreement, Washington said it would build two reactors in the North in exchange for Pyongyang’s agreement to freeze all nuclear weapons activities. But in October 2002, the United States said it had obtained intelligence that the North had been operating a clandestine program to produce highly enriched uranium to develop weapons and the U.S. State Department said North Korea admitted to doing so. By January 2003, the North withdrew from the Nuclear Non-proliferation Treaty. KEDO suspended its construction in November 2003. Two years later, the KEDO’s board decided to terminate the construction project, which was about 30 percent complete. In December 2005, North Korea asked KEDO workers to leave the country and said they would not be allowed to repatriate equipment and construction materials. At the time, KEDO and North Korea had agreed to leave materials at the site. Most belonged to South Korean subcontractors, and they had planned to sell off some of it to make up for financial losses stemming from the halted work. In January 2006, the Roh Moo-hyun administration in Seoul said the North had pledged to store the materials and that it expected the North to honor its word. Despite suspicions that the North had used some of the equipment in preparation for their second nuclear test this year, the current Lee Myung-bak administration has also remained silent. But intelligence sources tell a different story. They said the North started using equipment almost immediately after KEDO’s withdrawal and that the North Korean military was involved. Sources estimate equipment and materials are worth about 46 billion won ($39 million). South Korea, one of the founding members of the KEDO, spent $1.1 billion on the construction project. 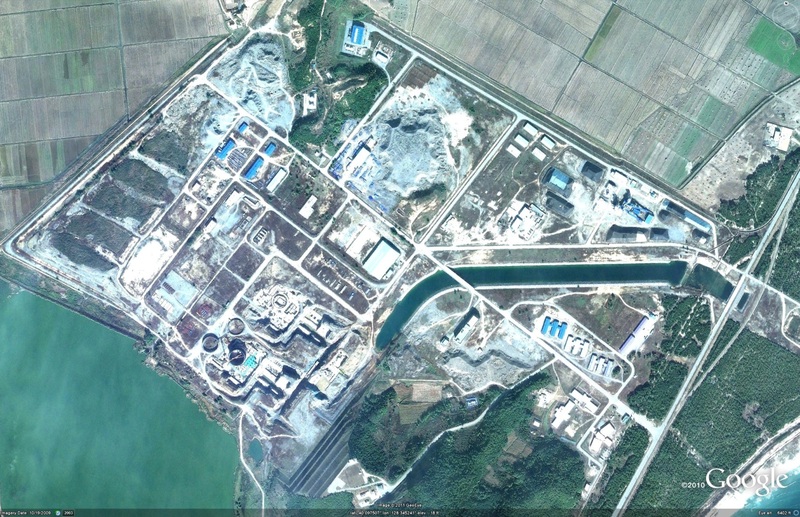 Here is a satellite image of the KEDO reactors. Here is an image of the KEDO residential compound. An international consortium yesterday announced the termination of a technically defunct nuclear reactor project in North Korea. The Korean Peninsula Energy Development Organization said it will also seek compensation from Pyongyang for the dissolution of the costly light-water reactor project in Geumpo. “KEDO requires payment from the DPRK for financial losses in connection with the light-water reactor project, and any issues between KEDO and the DPRK in this regard should be settled in accordance with KEDO’s agreement with the DPRK,” the statement said. DPRK stands for Democratic People’s Republic of Korea, North Korea’s official name. South Korea, the United States, Japan and the European Union created KEDO in 1994 after an agreement between Washington and Pyongyang to build a light-water reactor in the energy-stricken state in return for the North’s suspension of any nuclear activities. The construction began in Aug. 1997. But the project was halted in 2002 when the United States accused North Korea of a clandestine nuclear weapons program using uranium. The participating countries, most of which now belong to the current six-party talks, agreed last year that the KEDO project was defunct. All the materials that were being built outside North Korea for the reactor will be handed over to South Korea’s Korea Electric Power Corporation, the main contractor for the project. The materials, including a nuclear reactor, turbine generator and other supporting tools, are reportedly worth 830 million won. KEPCO will in turn bear some 150 million to 200 million won in compensation that must be given out to other smaller contractors involved with the project, the Unification Ministry here said. KEPCO will also be liberated from any other legal or political responsibilities that could follow the termination of KEDO by bearing the compensation costs, it said. North Korea, in the meantime, will be required to return all the other assets related to the light-water reactor. The entire termination will likely take about a year, the ministry said. South Korea has been taking the initiative in the $1.56 billion project. Seoul put up nearly $1.14 billion, while Japan provided $407 million and the EU $18 million. The United States was in charge of providing heavy fuel oil. All the South Korean and American workers who were staying in the construction site for maintenance returned home in January this year. After the invalidation of the 1994 agreement between Washington and Pyongyang, multilateral negotiations convened in 2003 under Chinese mediation. After years of deadlock, the six nations finally agreed on the joint statement of principles last September. Based on the new agreement, five of the six members are to give unspecified aid to the North in return for a complete dismantlement of nuclear programs. The implementation of the agreement, however, faces many hurdles as North Korea has since refused to join the next round of negotiations, citing the United States’ hostile policies. The death knell sounded on Wednesday in New York for a once-ambitious project to build two nuclear power plants in North Korea. The board of the Korean Peninsula Energy Development Organization officially abandoned the project, citing a lack of cooperation by North Korea. A statement from the organization complained of a “continued and extended failure” by Pyongyang to cooperate in international efforts to end its nuclear weapons programs. In Seoul, a Unification Ministry official said that the board of the organization, an international consortium overseen by the governments of Korea, Japan, the United States and the European Union, had also agreed to formulas on how to liquidate the assets of the organization. Because Seoul committed to shoulder the bulk of the costs of the nuclear power project, its termination, government officials fear, could leave it open to criticism for a waste of taxpayer money. To try to head off that criticism, the ministry official emphasized that even though Korea would shoulder the remaining outstanding costs of winding up the project, it would also take title to all the equipment that had been manufactured for the project but not yet shipped to the North. He said the value of that equipment was estimated at about $800 million. In total, he added, the Korean government has paid $1.1 billion of the $1.5 billion that has been spent on the project throughout its life; its remaining obligation in wind-up costs, he said, would be about $200 million. The project was conceived in 1994 as an effort to cool tensions between the United States and North Korea over the latter’s nuclear programs, which Washington believed were focused on developing nuclear weapons. Pyongyang agreed to freeze those programs in return for two power reactors and a supply of fuel oil that would continue until the reactors came on line. The agreement began to unravel in late 2002, when Washington accused Pyongyang of secretly developing a nuclear weapons program using uranium.Work on the project was suspended in November 2003, and North Korea ordered a KEDO caretaker force out of the site last January. A bid by Seoul to divide the termination costs among other KEDO members apparently failed. Seoul had tried to keep the project alive for as long as possible in hopes that the infrastructure at the nuclear site could be used in some sort of new arrangements with North Korea. The statement by the KEDO board also reportedly demanded – certainly without any expectation of success – that North Korea compensate the organization for its financial losses. As the KEDO nuclear project shriveled, a new effort to strip North Korea of its nuclear weapons emerged, the “six-party talks” among the Koreas, China, Japan, Russia and the United States, to try to find a formula to end the North’s nuclear ambitions. Those talks have also floundered. Yesterday, Pyongyang invited Christopher Hill, the U.S. negotiator at those talks, to visit Pyongyang to discuss efforts to revive them, saying his visit would be a sign of Washington’s political will to implement an agreement in principle last September that Pyongyang would abandon its nuclear efforts in return for development aid and diplomatic recognition. A senior Korean official said he doubted Mr. Hill would go, adding that Pyongyang would have to make some sort of gesture of its serious intent in order to tempt Washington into agreeing to such bilateral contacts. The Korean Peninsula Energy Development Organization, or KEDO, announced yesterday that the project to build light water reactors at Sinpo, North Korea, has been scrapped. The infiltration of a North Korean submarine into Gangneung, South Korea, in 1996 and the firing of a Daepodong missile in 1998 were all incidents that cast a shadow on the project. In particular, the admission in 2002 by North Korea that it was working on a nuclear program using enriched uranium was the final straw in the Bush administration’s decision to halt a project that it was already skeptical about. In response, the North withdrew from the Nuclear Proliferation Treaty in 2003 and went on to declare in 2005 that it possessed nuclear weapons. Such developments led to today’s situation. The confrontation between North Korea and the United States does give us something to think about. While agreeing with us on the denuclearization of the Korean Peninsula, the North secretly hung on to developing nuclear weapons. In response, in 1994, we cooperated with the United States but were not even allowed into the negotiations yet we still agreed to cover 70 percent of the cost of the light water reactor project. That may have been inevitable, because South Korea was the country most threatened. Nevertheless, it is debatable whether the negotiations in which Seoul paid the bills but had no say in the matter were the best method. This is an issue that the government needs to ponder seriously. It has also become clear that the changes in U.S. foreign policy with a new administration are too much for us to deal with. Even though we threw away $1.1 billion, a solution to the North Korean nuclear problem seems to be even further away, Washington continues to cling stubbornly to its new policies. So the administration should think about what it has learned from this experience and how it should use that knowledge. One good example is the announcement by Seoul last year that it would provide 2 million kilowatts of electricity to the North even before figuring out what the North’s answer would be. The announcement was billed as an “important proposal,” but the North has turned a blind eye to it and says it wants a light water reactor. With an astronomical amount of tax money already having disappeared, isn’t offering to provide electricity to the North another burden? Whether it’s North Korea or the United States, others have an ability to think strategically and look into their opponents’ minds. Why not us? You are currently browsing the archives for the KEDO category.